SIGN UP NOW using the link below. Note: In addition to the tuition and registration fee, there is a $10 materials fee, which is payable to the instructor in class. For more info, see “about the materials” below. Welcome to our Collage and Mixed Media class! 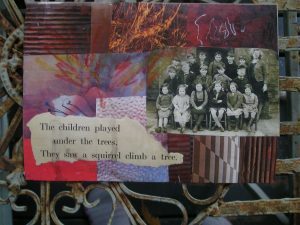 In this class we’ll have fun creating collages and learning about this fascinating and creative art form. There is absolutely no experience required! No drawing skills needed at all! No expensive tools to buy! Collage is a perfect way to get your creative feet wet. Before we get started with paper and glue, we’ll have a quick discussion of exactly what collage is – and what it isn’t! Then after we talk about the basics, we’ll dive right in to some fun and easy mini-projects. You’ll have an immediate understanding of different approaches you can take when creating a collage. We’ll start adding mixed media to our collages, including your choice of watercolor, ink, wax pastels and more. It’s a day devoting to the simple pleasures of experimenting with paper, glue and scissors! “Mixed Media Collage” (also known as “Collage and Mixed Media”) is a great class for accomplished artists to unlock their creativity, and a wonderful introduction for beginning collage students as well. Next, we’ll consider the glue options, especially glue sticks and acrylic medium. Finally, we’ll look at some of the many types of paper you can use to collage, including magazine and newspaper pages, rice papers, ephemera, fabric, etc., etc. During the day, we’ll also compare about cutting paper versus tearing it, and some techniques to do so. In our collage projects, we’ll explore different ways to use collage elements. We’ll be working quickly, on small substrates. There’s no time to over think things or worry about getting it “right”! Whatever you do will be exactly right. In the first few collages, we’ll use a simple object as the focus; choose a coffee cup, a chair, a vase of flowers. In one in-class project, you’ll see that with just two magazine pages you can make an exciting version of your object, cutting or tearing the shapes and colors that appeal to you. Next, we’ll see how collage elements under a quick sketch of our chosen objects can be so much more entertaining to the eye than just a plain sketch. We may choose to add more paper to the image after drawing. The possibilities are endless! There will be plenty more experimentation, time to play and learn by doing in this class! Before we add mixed media, we’ll try out an image transfer technique with packing tape and we’ll try out (bleeding) art tissue paper. We may also choose to try using maps as substrates, and see what magic their lines and shapes can inspire. As the class moves along, we’ll talk a bit about other media we can add to collage, whether we apply it directly to the substrate or treat the papers. We may choose to return to the morning’s design objects and see what happens if we watercolor it before applying paper. Or we make use stamps and stencils on papers before we glue them. We can also play with adding crayons, pastels and inks to our collages. We’ll talk about the strategy of working on more than one collage at once, to both allow for drying and for alternating inspiration as we sift through papers. Please remember to bring your $10 materials fee payable to instructor. The $10 covers the costs of access to all the substrates, glue, and acrylic mediums and collage materials you will need for planned projects. Also included is access to additional media, including: watercolors, wax pastels, colored pencils and inks. Any watercolor or acrylic paints you have at home, as well as stencils, stamps, ink pads.